Help Diabetes Hands Foundation reach its fundraising goal! Between August 31, 2010 and Sept. 14, 2010, we are holding a fundraising campaign to benefit the Diabetes Hands Foundation, the nonprofit behind TuDiabetes.org. Our goal is to raise $10,000 for the Diabetes Hands Foundation by September 14, 2010. All donations made are tax-deductible. 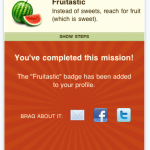 Whole Foods Market Missions app: a HealthSeeker ripoff? 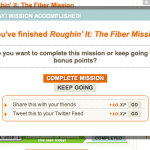 Get on a mission to better health! 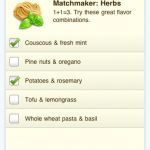 The Whole Foods Market Missions (WFMissions) app will help you broaden your palate by introducing you to a range of delicious, nutrient dense foods. Learn more about healthy eating and start a conversation with your social networks about the road to good health. 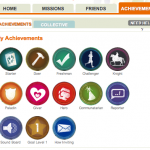 Missions — Complete steps of varying difficulty and earn badges through fun and healthy Missions. 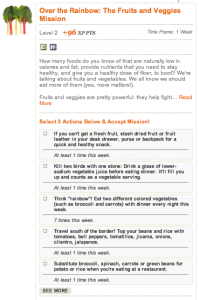 Tips – Get simple, practical advice on cooking, nutrition, green living, food storage and more. Save your favorites for easy reference. 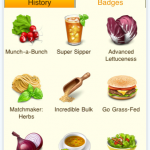 More than two months before, the Diabetes Hands Foundation launched HealthSeeker™, a new Facebook® game, with the goal of helping players make specific lifestyle changes that focus on healthy eating. While the benefits of the game are available to anyone, HealthSeeker™ specifically helps people with diabetes make more informed lifestyle decisions in an innovative way that complements their daily use of social media. There are MISSIONS and ACTION STEPS to help players achieve LIFESTYLE GOALS and create an opportunity to advance in the game. These LIFESTYLE GOALS include eating more healthfully, achieving or maintaining a healthy weight, improving one’s diabetes control and lowering cardiovascular risk factors. As ACTION STEPS are completed and players return to report their progress, they receive experience points and other awards for their achievements. HealthSeeker™ combines a supportive social networking environment with important information on managing diabetes. The game utilizes the player’s own Facebook® friends as sources of inspiration and support on the road to better health. All I can say is: there seem to be a LOT of similarities. Considering how broad this space is and how much resources Whole Foods should be able to put behind developing a truly innovative and groundbreaking app, I would have imagined that they’d try to avoid repeating the same thing that others are already doing out there… but I digress. What do YOU guys think?